Ah, the holiday season. It’s the purr-fect time of year to show the cat lovers in your life just how much you care! But what to do if you’re not sure what kind of present to get her? We’ve made our list and checked it twice. These 50 items represent unique cat themed gifts that’ll be sure to put a smile on the faces of all the feline fans in your life. Do all cat people love the same kind of stuff? Of course not. Not only are pet owners unique individuals, but so are their darling furballs! Is your cat-loving friend a foodie, too? 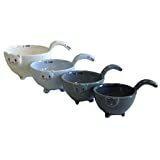 These measuring cups and baking bowls are adorable, practical, and easy to use! Made with beautiful earth-colored hand painted ceramics, the bowls (complete with tail-like handles) are super easy to stack, store, and display. Comes in a set of 4 (1/4 cup, 1/3 cup, 1/2 cup, and 1 cup). Cats sure do what they want…so why not get a reusable canvas tote bag to highlight their lovingly stubborn nature? This tote is ideal for grocery shopping, trips to the pet store, storing kitty supplies, or everyday use while out and about. This sweetly decorated bag features dimensions of 11” x 14” x 5” and can fit approximately 12 ounces worth of stuff. Taking a cat nap never looked so good! This plush kids’ neck support is comfortable and snuggly, and it’s adorable decorations will make your kid feel like she’s cuddling up with a cutie. Made with 100% polyester and featuring a hook for easy storage, this pillow is spot wash only…so try to keep it as clean as cats manage to keep themselves. 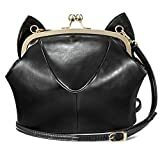 This well-made bag features a ton of variety, making it perfectly suitable for a fun night out or a day of errands around town. With dimensions of 7.8″ x 7.1″ x 4.3″, the bag has a sturdy kiss-lock closure and an adjustable over-the-shoulder strap. As cute as a kitten! Your friend and her feline will love sharing breakfast together more than ever. This silicone egg mold turns an ordinary sunny-side up into a smile-inducing treat! Made with durable, heat-safe, food-safe material, transform any meal into a “fancy feast” with this functional and unique gift. 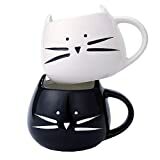 Your kitty-loving loved one will adore these matching coffee mugs—one black, one white—for tea, coffee, or whatever else she craves. These hand-crafted mugs are fine quality and made with eco-friendly, FDA-approved ceramics. The sweet little ears will really help brighten your day (almost as much as the caffeine in your cup o’ joe!). Any cat-lover worth her salt will know just how wonderful it is to snuggle with her feline. This little nightshirt is a sweet way to reminder your friend just how wonderful cat cuddles really are! The shirt is made with 100% cotton and fine-quality screen-printed artwork, plus it comes with a matching drawstring bag. For anyone who wants to lounge around in style (and doesn’t mind getting a little cat hair on clothing), these cat-themed PJs are a great gift. The matching bottom and top are colored with AZO-free dyes and come pre-shrunk so you won’t have to worry about the PJs becoming too tight after a wash.
After a long day at work, many pet lovers will agree that the two best things to come home to are 1) their kitty curling around their legs, and 2) a decadent glass of wine. Combine the best of both worlds with this incredibly designed cat-shaped wine stopper…sure to be a show stopper, to boot. 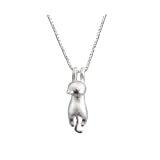 This sterling silver necklace is reminiscent of that well-known motivational poster featuring a kitty hanging off a branch with a caption that reads, “Hang in There.” It’s nickel-free and comes in a gorgeous box for a beautiful presentation. Let your cat-loving friend add a bit of flair to her outfit! If you think someone would be wary about cat-themed jewelry, this elegant ring gives a graceful touch of feline inspiration without going overboard on cutesy. 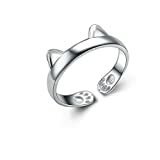 Subtle and simple, the ring features cat ear and cat paw details and is adjustable, so it can fit many different fingers. 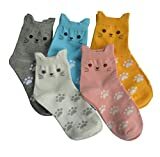 If your friend, family member, or co-worker has a shoe size between size 5 and 8, these cat socks will fit her well! Imagine how cute the little ear details look popping up over a pair of sneakers? The gift comes with 5 different pairs (gray, blue, orange, pink, and off-white) and the socks are made out of 80% Cotton + 15% Acrylic+ 5% Spandex, making the stretchy and comfortable. Not only is this shower curtain extremely fun to look at, but it’s also a practical gift because it comes with shower ring hooks and requires no additional liner since it’s made with 100% durable polyester. Let your friend have a little fun in her morning shower by enjoying the view of these sweetly-framed kitties. Is your loved one as playful as her beloved four-legged friend? These fuzzy cat ears, paws, and tail are ideal for festive events from Halloween to dress-up! One size fits most. No more boring brown bags! This reusable lunch bag is made with machine-washable, eco-friendly, and stain-resistant material that keeps food well-insulated for up to 4 hours. It also features a subtle yet adorable feline pattern designed by a global artist. The bag comes in at 12” x 12” x 6.5” and fits containers up to 7” x 6”. We love versatility just as much as utility in gifts! This extremely unique cat-shaped trivet makes a statement and makes serving dinner safe and easy by keeping hot plates off the tabletop. It’s also great for coasters or even wall art. The trivet is made with gorgeous cast iron metal and is a breeze to clean with a damp towel. A lot of cats love scratching, and a lot of humans love scribbling. This cat-decorated journal features an adorable feline wearing a bow tie. For any feline fanatics who love journaling or keep a diary, this gift will definitely be put to good use. Baking never seemed so different with this gift that keeps on giving. 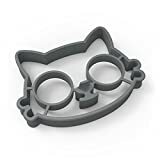 These silicone cake molds allow your friend to bake creations shaped like a lounging kitty! The material is specifically designed to allow the treats to slip out easily when done baking…no more sticking to a pan and ruining a fresh batch. You’ve probably never seen a pillow cover quite like this before. This cotton linen blend pillow case fits 18 x 18 inch inserts (not included) and has a hidden zipper for a seamless and streamlined look. Throw in the wash if it gets soiled and feel free to tumble dry, too. Aprons are one of those things that people love to have but rarely get for themselves. 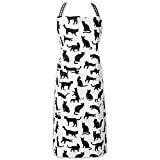 This elegant yet fun-looking apron features a black and white design with different types of cats, and comes with extra long ties for easy adjusting on any sized cook. It’s made with 100% cotton and is machine-washable. 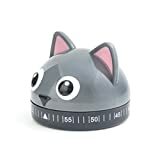 Your cat crazy friend will never forget something she’s left in the oven again when she’s got this great little kitty kitchen timer to remind her when the food’s done! Recipients can get creative, too, and use it throughout the house for a good time timing whatever task is at hand. 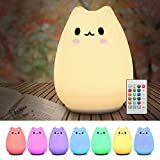 For any kids who like a nightlight, this little remote control LED silicone cat lamp will comfort them as they sleep almost as well as a real kitty! It’s made with BPA-free material and has no sharp edges, making it safe for little ones. It also can be controlled with a remote or even with a gentle clap of the hands! It’s fully adjustable and comes with different colors and brightness levels. 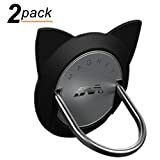 An over-the-door hook hanger is ideal for a cat parent who rents their home or can’t install permanent hooks into their doors or walls for any reason. 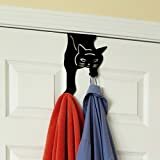 This cat-themed hanger can hold up to 20 pounds and helps keep towels off the floor (away from curious furballs). It’s a small little attention to detail that’ll absolutely make someone smile when they spot it. Reduce clutter! Holds up to 20 pounds. Fits door widths measuring up to 1.5 inches wide. Why say it when you can STATE it? 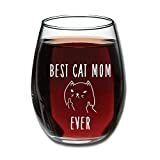 This wine glass says “Best Cat Mom Ever” along with the image of a…ahem…flippant cat. Give the gift of giggles to go along with your gal pal’s favorite Pinot Grigio with this conversation-starting stemless glass. Gorgeous, warm, and comfortable: what else does a man or woman want with their bedspread? For a warm night snuggling in bed next to their fave feline, give this 3-piece quilt set (2 shams plus a quilt) featuring a reversible side for even more style variety. It comes pre-washed for the classic heirloom feel, and owners are recommended to machine wash in cold water, line dry, and light steam iron. We can see it now: little four-legged family members snuggling up on this soft and comfy area rug. Measuring 33.5 x 18 inches, the mat is durable and anti-slip, plus it comes with a Hughapy mermaid necklace as a bonus. Handmade with gorgeous embroidery, it makes a warm place for feet or felines! Polyester, Every cat mat will come with a beautiful hughapy mermaid necklace. This original rolling pin is laser-ingraved with cat designs allowing people to transform shortbread cookies into showstopping treats. It’s a great way to make baked goods stand out at the school bake sale or even as a simple dessert at home. 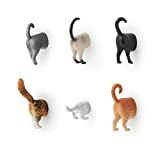 If you want your friend to laugh every time he or she opens up the fridge or hangs up their grocery list, then these kitty bum magnets should definitely do the trick. They feature the derrieres of six different breeds of cats and are made with durable phthalate-free vinyl. If you know a cat family that loves family game night, rest assured that this Cat-Opoly game will get them all geared up to play! There’s nothing like a little friendly, cat-inspired competition to make for a fun night in with family and friends. Just wait until you see the player pieces! Leggins are virtually synonymous with lounging. But a gal can also pair these up with a sweet pair of kicks for a fun little Saturday outfit, too! These cat-printed leggings come in a variety of sizes and aren’t transparent, so chic stays classic. The manufacturers do recommend cold hand wash and hang dry to prevent excessive stretching, but they are machine-washable in a pinch. If you want to give your family member or friend something that’ll stop traffic, this little naughty kitty garden gnome is your go-to gift. Sure, she may be snacking on little garden gnomes, but the kitty figurine is still adorable and can really stand out on a porch, flower bed, or front yard. It’s made with durable resin material so it’ll withstand weather, but it’s also small enough to fit inside on a bookshelf if preferred. 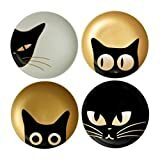 If you know a cat lover who loves to entertain guests, consider giving her these cat eye plates. They turn cocktail hour into something way more adorable and festive, and are a gorgeous way to plate appetizers and other tasty treats. They’re made with high quality porcelain (not microwave-friendly, hand wash please) and come in a 6.5″ diameter. 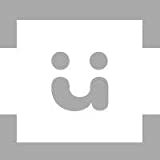 designed and manufactured by Jewel Japan who bring fun to life! Give a friend some wall art that’ll turn heads. This 24 x 24 inch stretched canvas features 100% hand-painted oil paintings, making them literally one-of-a-kind gifts! It comes ready-to-hang anywhere with a fixed hanging accessory—perfect for a bedroom, bathroom, entryway, or anywhere else that could use a little beauty. Your friend will be happy to open this gift if the weather outside is frightful. 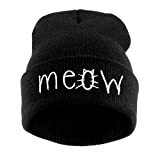 This knitted beanie features a simple “Meow” statement and will really help someone stand out in a crowd. Who knows—it could help her meet other cat lovers as well as stay warm on a cold winter’s day! There’s something kind of boring about storing a wine bottle on the counter…unless you buy this gift, which adds a unique twist to kitchen or bar cart decor! 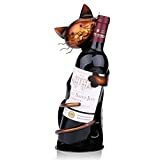 This sturdy cat-themed wine bottle holder is made with metal and handcrafted with pure craftsmanship. 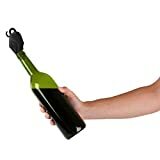 As if someone needs any more inspiration to pop open a bottle of wine! Help your loved one organize a bookshelf with some kitty-friendly decor! These cat-shaped metal bookends are subtle, sturdy, and provide a fantastic attention to detail that really makes a home office stand out. Choose from black, red, green, or white. The bookends feature non-slip black matting to avoid slipping and scratching. 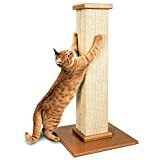 All right, this scratching post may be for your friend’s cat and not your friend, per se. But if you can gift her something that’ll keep her feline from ruining her furniture, we think she’ll be pretty pleased! 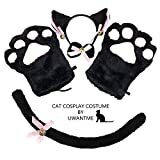 Let her kitty satisfy her scratching needs that’s sturdy enough to withstand little claws and tall enough to allow a feline to stretch. 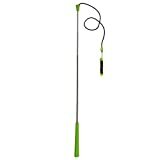 Help your friend keep her kitty active and entertained with this endlessly fun ground wand. 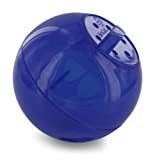 It’s easy enough to use while you’re lounging on the couch and the kitty is scurrying around after the toy. Importantly, it’s also a safe way to let a cat satisfy her natural hunting instincts. This might be a gift a cat will end up wanting every year for Christmas! The small mouse-shaped toys (packed with catnip!) will delight the feline’s natural predatory instincts and let her bat around, carry, and chase to her heart’s content. No real mice will have to be harmed in the process! And the bright colors make it easy for a cat owner to spot. If you’ve ever heard your friend express concern about her cat’s weight or activity level, this food dispenser could be an ideal and thoughtful solution. Not only does this food dispenser encourage fun chase-and-play around the house, but it helps divvy up meals into smaller portions to help cats slow down and avoid stomach upset. Fit many different kibble sizes inside, and fit it in a top-rack for dishwashing. No wires, no worries. If a friend wants some help keeping her kitty warm, this self-heating warming bed makes for a wonderful and thoughtful gift. It comes in gray or beige with a cute spotted design and features a super innovative interior thermal layer. This layer reflects back a cat’s own body heat, keeping her warm and snug. Cat parents love watching their animals be curious! 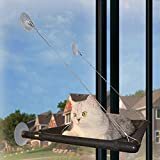 This cat window perch/hammock/window seat gives an animal a great view of the outdoors in a comfortable place to lounge. It installs in seconds with industrial strength suction cups that can hold up to 50 pounds, and the seat itself is easy to wash and clean. Cat lovers may not detest cat hair on everything, but they probably enjoy anything that’ll help them avoid it! 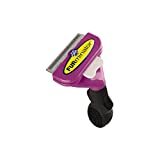 The FURminator works on long-haired and short-haired cats and helps keep kitty coats healthy, gorgeous, and tangle-free. Features an ergonomic handle to make brushing easy for human and pleasant for feline. Do you know a cat lover who’s also a book lover? This book, written by writer and hiker Laura Moss, showcases some adventurous kitties who are truly getting out there and seeing the world! It could be a good read for some simple entertainment, or maybe even a little adventuring inspiration, too. We dare you to find a coffee table book that’ll make you laugh more. This book features gorgeous and hilarious photos of cats enjoying an all-time treat. Comfortable, cool, and cat-inspired design? Yes please. Let your friend sip her favorite beverage of choice in style with this 11 oz mug. It’s safe for the microwave, but tell your friend to hand wash it so the tail-shaped handle won’t break. 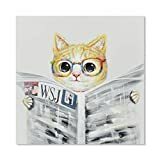 Whether she wants to hang pictures of her kitty or pictures of anything else, your friend will love these picture hangers featuring a sweet cat design. Comes with 8 clips and a 36 inch cord. Snuggly and warm for human AND kitty? This hoodie goes beyond the norm by providing a snug and secure pocket where a cat can sit and nap! The hoodie also features cute cat details for extra pizzazz. Friends don’t let friends bail on their kitty time. 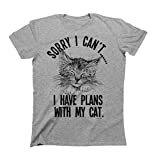 Remind your pal that you respect his or her need to bond with their feline by gifting them this hilarious and tongue-in-cheek slogan T. Made with soft material and comes in a variety of colors and sizes. Brand new Mens/Ladies Unisex Fit T-shirt. Taking a selfie with a kitty can be hard enough. Trying not to drop the phone makes it even tougher! This magnetic ring phone holder is multifunctional (use as a finger ring or stand) and fits iPhone X, 8, 7, and 6s, as well as Galaxy S7, S8, S9, and others. 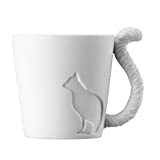 Cat lover gifts are a fun way to show appreciation of your friend and her feline. So, whether you know any pet owners at work, in your family, or among your circle of friends, keep this list hand for some cute Christmas and holiday ideas. ‘Tis the season, after all!